What makes Barca's Messi and Guardiola the world's best? Lionel Messi (left) was crowned the world's best player on Monday, while Guardiola was named football's top coach. This week I traveled to Zurich to cover the 2011 FIFA Ballon D’Or awards ceremony. 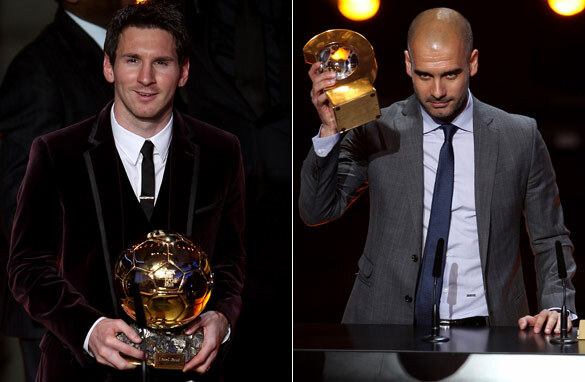 The event crowned Leo Messi as the best footballer on the planet and Pep Guardiola as the top manager in the game. No argument from me on both counts, as the little Argentine and the Spanish coach enjoyed a phenomenal year during which Barcelona won five out of a possible six trophies. While I was in Switzerland, I was asked by several colleagues why I thought Barca were so good. Was it the academy, was it down to Messi’s brilliance, or Xavi’s playmaking ability perhaps? Definitely they are all factors which have contributed to the club’s success, but after closely observing and speaking with the players and coach, I believe the truth lies deeper. I am one of the privileged few who have had the opportunity to spend quality time with some of the world’s top athletes. Through my work at CNN and hosting galas for FIFA and UEFA, I have had an inside look at the lives and habits of football stars and I can tell you there is something about Barcelona’s coach and players that sets them apart. It comes down to their mentality and philosophy, which is based on three factors: unity, equality and respect. You know what Messi did when he won his third straight Ballon D’Or? He thanked Xavi. What did Guardiola do when he picked up his award? He dedicated it to his assistant Tito Villanova. They forgot about their individual achievements and focused instead on the work of the group. It is never about "I", it is always about "us." At the pre-gala press conference, I asked Guardiola and Alex Ferguson, another nominee for coach of the year, if Messi should already be considered one of the best players of all time. Fergie didn’t hesitate. The veteran Manchester United coach praised the Argentine’s skills, comparing him with the likes of Alfredo Di Stefano, Diego Maradona and Pele. What did Pep do? He immediately pointed out that Messi has only been able to shine because of the group of players that are around him, and emphasized that if he continues to work hard with his teammates, then one day he could perhaps be considered among the best in the history of the game. To Pep, everyone is the same. Everyone is equally valuable. No wonder Samuel Eto’o was shipped out to Inter Milan in 2009. No wonder his replacement Zlatan Ibrahimovic was deemed surplus to requirements. Both of these players did not put the team before themselves, and that is just not acceptable as far as Pep is concerned. When it comes to respect, I was very impressed with how much of it Guardiola - at 40, a relatively novice coach given that he took his first senior post at Barca in 2008 - has for the history of the game and how much players have for him. Before, during and after the gala, Pep spent most of his time talking to Ferguson - the most successful British football manager after 25 trophy-laden years at Manchester United. You could see the admiration in his eyes when he was speaking with the 70-year-old. Even though he has beaten the Scottish manager in two European Champions League Finals, and has an incredible haul of titles in his short tenure, it was clear to me he still felt like he was the apprentice and Fergie the master. As far as Pep’s relationship with his players is concerned, I can tell you it is incredibly healthy. They respect him and esteem him and would do anything for him. Because they are all treated fairly and equally, they feel comfortable in their own skin and don’t have to try to be something they are not. One final word about Messi. As Xavi told me this week, the 24-year-old will probably beat every record in his career, but let me tell you, he remains as humble as ever. I interviewed Leo for the first time five years ago and I have spoken to him many times since, and he hasn’t changed. The money, the fame and the lifestyle have not affected him one bit. He is still a kid who just loves playing football and hasn’t even realized how special he is. For the good of the game and Barcelona, I hope he never does. messi best footballer of all time and guardiola is a good manager, but i hope he tests himself at clubs like ac milan or arsenal just to see if he make them just as successful. Also one last point, when man city start winning trophies every season, people will not admire and respect the players like at barcelona because the man city players are not a unit and only care about fame and money. Lets hope more clubs be like barcelona and less like man city.Oh ah im a newcastle supporter, so nobody can say i'm a united fan slaying city. Messi's humility is admirable in spite of his fame and fortune and that is why he is revered so much around the world. He is already one of the all-time greats and, at this rate, he is on course to be THE best all-time great. Will Messi be remembered as the best player who never won the World Cup? Messi is the best, sexiest and most humble player i have ever seen.He deserves the best and may more trophies come his way.Tip to Ronaldo:Try to be like MESSI! I never got to watch the likes of Pele or Di Stefano but I have had the privilege to Watch Messi, Iniesta, Xavi, C.Ronaldo. Those are quality players. The best in football I must say. I don't think Pele and Co had the skills we see in modern football today. Though Messi hasn't won any World cup yet, he is up there in the list of the elite footballers of all time. I'd say the best I have watched and yes I Remember Zidane, Rivaldo, Ronaldo (Brazil). But then again I think there is a team factor. Barcelona brings out the best of Messi and thus making him the best Player of this generation. Very well said!As a barca fan I learn a lot from your statement here!Football is a teamsport not an individual one.You win a world cup or a championsleuge because the whole team is good.that's why I don't agree that they say that maradonna won a world cup on his own. Unity, equality and respect. Pedro these three words are needed in dealing with any kind of problems humans face: from maintaining harmony at camp nou to saving the world from nuclear threats. Any. Thanks. Zidane;Pele and Maradona were the best in their own generations but Messi at his age is already surpassing all of them.I think Messi will be to soccer what Jesus Christ is to all mankind. Messi is a great player in a great team. Not sure if he's the greatest of all time because he's not proven himself to be a great player on an average team. It's well documented that his performances with Argentina sink way below his standards at Barcelona while his compatriot, Diego Maradona, Pele with Brazil and Santos, and even Zidane were rarely less than stellar whenever they pulled on a jersey for club or country. But he's definitely the best of his generation and he appears a humble guy on a team that plays without egos which I agree is the key to their success. Must say it's funny to read Mr. Pinto so full of praise for Leo, Pep, and Barca as he's such a fan of Mourinho, Ronaldo and Real Madrid all 3 of which are as egotistical as they come. another tip to Ronaldo: MESSI was unstoppable, MESSI is unstoppable and MESSI will be unstoppable. Messi's humility and gratefulness shows his acknowledgement of the great loving God,Jesus Christ,source of all his talents and good fortune. Messi will never be beaten. He will always remains no 1. Stay as good as you are.Even though you fall you always have a way to stand up,something no-one that plays soccer does. May you stay with GOD and and his word because it is your streght and guidance. You go MESSI!!!!!!!!!! messi is my man, too wonderful and smart. best in the world. Mr. Alehandro I think you have no ability to judge a good player, A good player is judged by his humbleness, gracefulness, speed, the ability to control the ball, magic passes and above all the number of goals he scored. You say Messi does not shine so as Marodona and Pele did shine and won world cups for their countries, and Messi for not having not won a world cup yet for his country, beside your comments that Bacelona is one of the best teams in the world and therefore Messi shines. Please withdraw your statement immediately. Look at the Argentinian side I think they do have better players than Bacelona, some of the best players are playing for Real Madrid and manchester ciy and some other European teams. What is the difference here is Argentinian players are not in a unity where Barca players are united.and play as a team. So if the same goes with Argentina team they can easily beat any opponents in the world, and this will give Messi an edge to shine as he now shines for Barca. Hope you got my point. I am not criticising you, Just making my point. Really nice article. Thank you. I follow you report on CNN in UK. It's is nice to know such stories about Barcelona players, pep and Messi from you. i think people in general evolve physically, mentally. and so do sports. the sport being played today is at a higher level than in the 60s and 80s. Unity, equality and respect: Pedro I have to agree with you completely as this is the bed rock of great team success in all field of life. This is also the simple reason messi and baca will always be legendary. Messi has become the synonym of perfect football. It is beautiful and very entertaining watching him on the football pitch, He is just adorable on and of the football pitch. He reminds me of Michel Jordan. Great on the basketball court, great person of the pitch. Both have a few thinks in common: Great talent, remains humble and even being best in their respective sports, " they are very down to earth. I told all ma frnds b4 dat messi is going to be crowned. Cos is d best player I hv ever seen in d planets gba fun oga e Up baca Up messi! Messi is the best i have watched grace the football pitch.together with his peers Xavi,Iniesta,Pedro,Villa,Puyol,Abidal,Alves,Keita,Pique they are the best team ever. In any vocation humility is paramount. Playing beautiful football is a vocation. Though massively gifted with talent and blessed with success Leo has been conducting himself with dignity on and off the field. Young manager Pep too has shown wisdom in victory and defeat. The duo deserved the top honors. Congratulations to Messi and Guardiola for trying to take the Beautiful Game to the next and a higher level. Leo,,just remain focus and ignore brutality in football. God will lead you on with more anointing. With your age, world cup is at your finger tip.You and and your team always give me unspeakable pleasure watching football.You are not a rival to anybody, You are what God makes you,with your humility HE will never forsake you.Ride on fine man.